We are finding there are many ways to brew a cup of coffee and each brewer brings out a slightly different taste. That is one of the reasons we use at least three different brewers when we review a new bag of coffee. It’s all part of the coffee adventure. 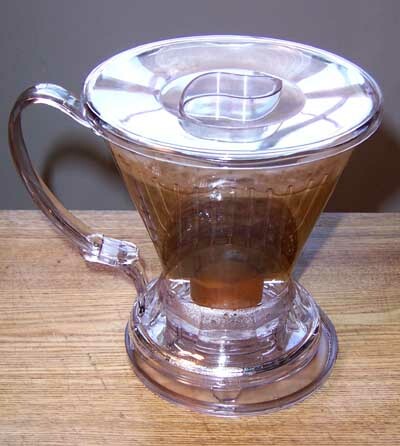 For a little over a month we have been trying a Clever Coffee Dripper made by the Abid Co. (www.abid.com). It is made of high grade plastic and is an interesting design. You can brew one normal mug or two small cups at a time. If you like the taste of French Press brewed coffee you’ll like this brewer. Some of the things that we like are that you can control the grind, the amount of coffee, brew time, and the amount of water. 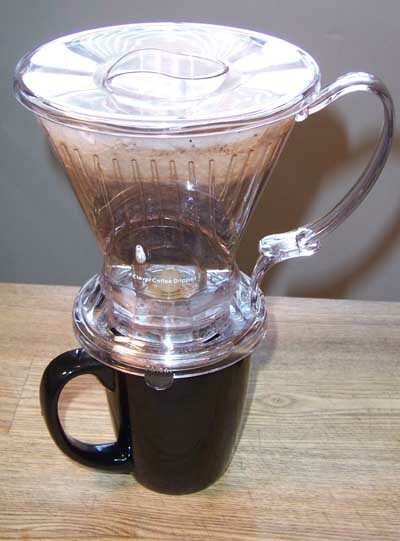 Brewing one cup of fresh good tasting coffee couldn’t get any easier. Clean up is easier than you can imagine too. 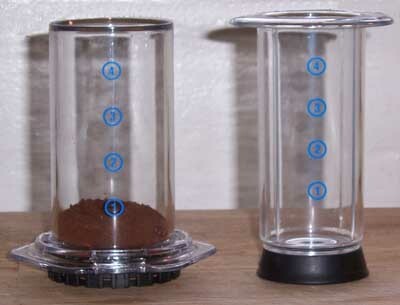 First you have to decide whether you want regular or decaf and grind it similar to a French Press grind. Put the # 4 size filter in the dripper (some people have told us that they run hot water through filters to remove the paper taste) and add your coffee. Pour the hot water to the desired level and give it a quick stir. Then put the lid on and wait. We let it brew for 5 minutes. After the wait set the Dripper on your coffee mug and it will begin to pour through into the cup. It really is that easy to enjoy a good cup of coffee. Clean up is easy too. Throw the filter out, rinse the Dripper and let it dry. We use it all the time now when we want just one cup of coffee. You can use it at home, the office or take it on trips. The Clever Coffee Dripper comes with a pad to set on while the coffee is brewing. No coffee has leaked out while we have been using this. The way it is designed the coffee will not come out until it is set on a coffee cup. It is easy to use, makes good coffee and seems to be durable. If you are looking for a new coffee brewer we suggest you give this one a try. We received this brewer for free and offer objective feedback. Until next time stop and enjoy the coffee and conversation. We received the AeroPress Brewing System (www.aerobie.com) a couple of weeks ago and we were looking forward to trying it. It is described as a 1-4 cup Coffee and Espresso Maker. It comes with everything that you need to make coffee except for the coffee and a cup. It even comes with pretty clear directions on how to grind and brew the coffee. It was designed by a Stanford University engineering lecturer and sports product inventor. To say that this brewer is interesting is an understatement. But the proof is in the taste of the brewed coffee. In the letter that accompanies the brewer they tell you that you may need a couple of pressings to feel comfortable with the press. I would say that is an accurate statement. It almost reminds me of a big syringe or a science experiment. I will admit that I was a little skeptical that the coffee would taste good because it seems to be brewed too fast. So we tried it a couple of times with both regular https://takecourage.net/2010/06/19/coffee-review-higher-ground-roasters-mexican-chiapas and decaf coffees. If you read the directions, and I did, it really is easy to use. You just have to get over thinking that this thing is weird looking and wondering if the coffee is really going to taste good. 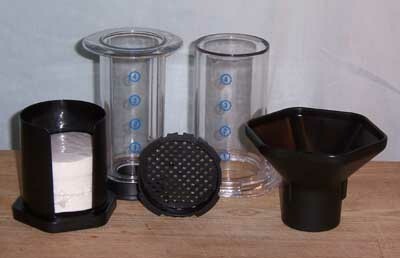 You grind your beans fine and put a paper filter in the cap and connect the cap to the chamber. Then you put the chamber over your cup. It even comes with a funnel if you want to use a smaller cup. Next put two scoops of ground coffee into the chamber and add hot water. Add your hot water to the number two on the chamber and use the paddle that comes with the kit to stir the coffee for ten seconds. Then wet the rubber seal on the plunger and slowly press down for 20 – 30 seconds. You have just made a double espresso! Yes, it does taste good. If you want American style coffee had more hot water to taste and stir. Yes, it tastes good too. 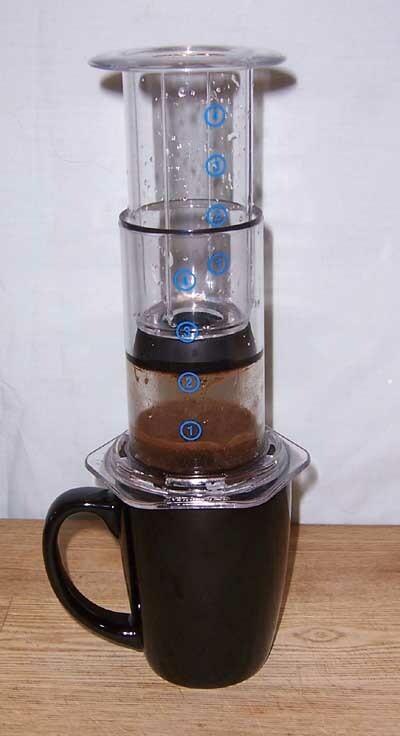 It really is that easy to make a good tasting cup of coffee with the AeroPress. Clean up is just as easy. I might be using the word “easy” too much but this AeroPress is easy to use and easy to clean up. Both regular and decaf https://takecourage.net/2010/06/12/coffee-review-brazil-daterra-decaf taste good brewed in this press. We like using this brewer and drinking the coffee it makes. We are glad to be adding it to our array of brewers for coffee reviews and for when we just want one cup of coffee. It is unique looking and will lead to some good conversations with family and friends. Whether you want something to brew just one cup of coffee or want to try a new brewing system, this could be the right choice for you. We received this AeroPress for free and offer objective feedback. Until next time, remember to stop and enjoy the coffee and the conversations.